We are proud of our reputation in the Middle Georgia area. Here are a few reviews from some of our clients. It all started with my purchase of 2.5 acres of land on Nancy Branch Rd in October of 2011. I had hired someone else in November of 2011 to partially clear the land in a certain fashion at a fixed price and was left in December 2011 with a lot of headaches. Harris and Company was recommended as a firm that could finish the job right. Jack and I met on the land in January 2012 and I gave him an idea of what I wanted to accomplish and he got busy. He got me in touch with the correct County Officials at Code Enforcement. I had an Erosion Control Plan drawn up by Phil Chivers and I submitted it to Code Enforcement, Baldwin County. By 26 February 2012 the land had been contoured, root raked, erosion control fenced per the Erosion Control Plan, seeded with rye, centipede, and carpet grass, and Bryan had installed an irrigation system for me consisting of over 108 sprinklers to cover the entire 2.5 acres. Bryan’s technical knowledge about irrigation controllers, wiring, valves, heads, pumps, plus his ability to determine adequate water flow necessary versus actual are the best that I have ever encountered. I recommended him to others and will continue to do so. He is the best! When the first rains came and the runoff was red, Jack held my hand and showed me it was colored because of the red soil with little or no silt. By March 3, 2012, the rye grass was up and starting to grow. By April 21, 2012, we had a good stand of rye grass over most of the area and I had planted 20 gardenias, purchased thru Jack, across the Nancy Branch road side of the property and up the north lot line . It looked beautiful to me! By October 1, 2012, the centipede and carpet grass were starting to show up; and Harris and Company had located, purchased, and planted 13 each Cleyera Japonicas, each five to six feet tall, behind the gardenias along Nancy Branch road. Since then Jack has helped me locate, purchase, and plant: 50 ea 3gal azaleas; 6 ea Autumn Blaze Maple trees,8-10’ tall; 8 ea Yoshino Cherry trees, 7-8’; 3 ea Tulip Poplar trees, 6’ tall; 3ea pear trees, 5-6’tall; centipede sod and 10 ea Burfurdi Hollys; 7 gals ea. All of these plants are alive and thriving. Bryan has moved and replanted numerous boxwoods and azaleas that are also doing well. The care they take while planting not only speaks well of Jack and Bryan, but of the members of their crew. They are also neat and tidy. My 2.5 acres are doing well and just getting better. 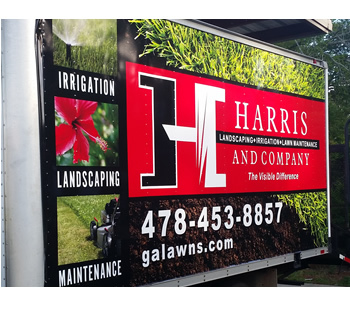 Harris and Company has done excellent work for me over the past ten years, from residential to large commercial irrigation and landscaping jobs. They do it right the first and they service what they sell. I recommend Harris and Company to anyone who wants headache free work done.